"You May Already Be a Wiener" - available from Bird Legs Press or Amazon.com. Photos by Sharon Fox My friend Geri is as "country" as a Jewish girl from the San Fernando Valley can get. Geri has enjoyed a high-powered career as a journalist, an award-winning speaker and business analyst, and now an author. She used to run with the in-crowd in Washington, but she prefers raising chickens to making small talk with Senators. 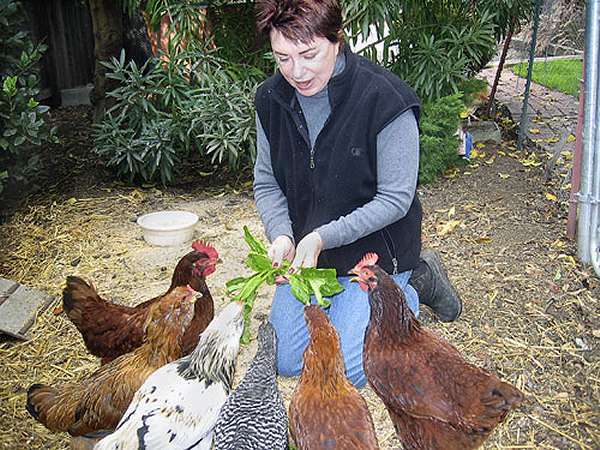 On a street near the geographic center of Palo Alto, Geri keeps a backyard flock of Rhode Island Reds and Barred Rocks. On April 18, she brought her babies home. On September 27, she got her first egg. Cost to produce that egg: $1500. Raising chickens for eggs is about freshness, organic-ness, and freerange-ness. It's about bonding with God's creatures. It's not about economics. Still, Geri and her husband Rick (the Harvard Handyman) set up shop frugally. They heard about a big wooden packing crate that was free for the taking, so they picked it up, took it apart, and re-built it into a coop with nesting boxes and a hen-sized ramp. Even the paint was free. FREE CONSUMER TIP: Some paint stores give away paint that has been custom mixed and returned. Rather than pay a fee to have it disposed of (it's a hazardous material, you know) they will give it to you for nothing. Geri snagged a gallon of "seafoam" for the outside and a tasteful "gray-raspberry" for the interior. It was so "Palo Alto" even the Architectural Review Board would have approved. Such an elegant abode deserved a name, so they christened it Chateau Cluck. When the coop was ready for occupancy, Geri picked up the chicks. Just two days old, they were fuzzy little things they named Zoe, Samantha, and Phoebe. They got used to their surroundings, they bonded to Geri, and the neighbors didn't complain. Life was good. Then one day, the Chicken Lady of Palo Alto got an inkling. Something was not quite right with Zoe. Following her hunch, she posted a couple of close-ups of Zoe on the Internet. Geri had made chicken-lover friends all over the country, and her panel of experts confirmed her suspicion: Zoe was a Zorro. Much hand-wringing ensued. Not only would Zorro not produce eggs, but he would turn into a loud, crowing pecking machine, which is something that is just not acceptable in the suburbs, especially in Palo Alto. Not wanting him to end up in a stewing pot, Geri sent Zorro into exile. 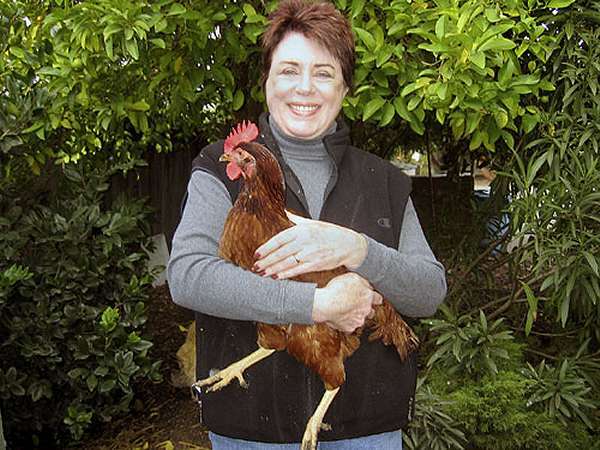 She took him to a farm in East Palo Alto where a nice lady took him in and even gave Geri two hens to keep her from missing Zorro. Geri spent that first night frantically searching the ground for her new charges with a flashlight while they sat quietly above her in the pear trees. It wasn't until daybreak that she found them. She would have hugged them if they had let her. The next night, the old girls decided that they would also abandon Chateau Cluck in favor of a perch in the fruit trees. It took 30 minutes of feather-ruffling and squawking for them to establish their pecking order. In the end, Phoebe was Head Hen, and her girl Sam was second in command. The new kids were allowed to sleep in the same tree, but on lower branches. Geri still thought that that Chateau Cluck was the best place for them, so she tried to capture them to tuck them in for the night. They weren't having it. Hannah flew over the fence, took off and wasn't seen for three days. Just as Geri was thinking about putting Hannah's picture on a milk carton, she showed up, whiskey on her breath and a tattoo of Foghorn Leghorn on her left drumstick. Then came the day they had waited for: the big payoff. Phoebe was showing all the classic signs of impending motherhood. She was restless. She was cranky. She ran around flapping her wings. Then she presented Geri and Rick with her first offspring - a perfect, GradeAA, organic egg. Geri took a photo and sent an e-mail to her friends, who had been breathlessly awaiting the news. "Our first egg!" said the subject line. I opened the attachment, anxious to see what it looked like, this long awaited offspring of Phoebe, their precious Barred Rock. I expected to see the proud grandparents, tired but happy, tenderly holding the precious little shell while Phoebe recuperated in the Chateau. What did I see? Phoebe's firstborn in an iron skillet, sunny side up.